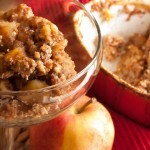 Baked millet with apple pie spice and fresh chopped apples. The perfect, easy gluten-free and dairy-free breakfast the whole family will love. 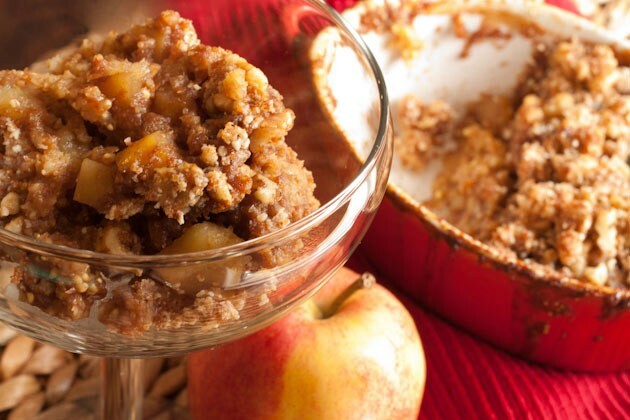 In a blender, combine apple juice, dates, vanilla, cinnamon, maple extract, nutmeg and ginger. Blend until smooth. Pour mixture into a 4 cup casserole dish. Add diced apple, millet, and amaranth to the casserole dish. Cover and cook for 80-90 minutes or until grains are fully cooked and most liquid is gone. Meanwhile prepare topping by combining all topping ingredients a couple of minutes before bake is done. Remove casserole dish from oven and cover with topping. Return back to the oven for 10 minutes. Remove from oven and allow to sit for 15 minutes before enjoying.